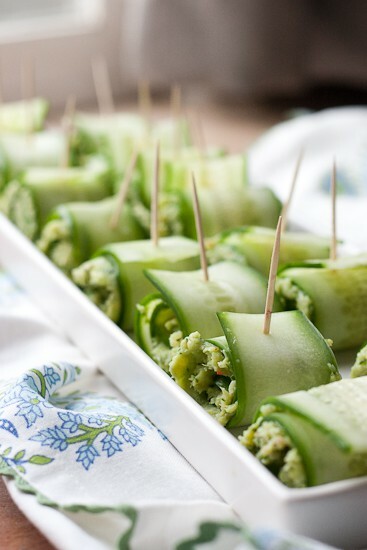 I made these Pesto Shrimp Cucumber Rolls for a baby shower recently and though they’d be a great idea for a game munchie. I thought my timing was brilliant. I suppose that’s that. 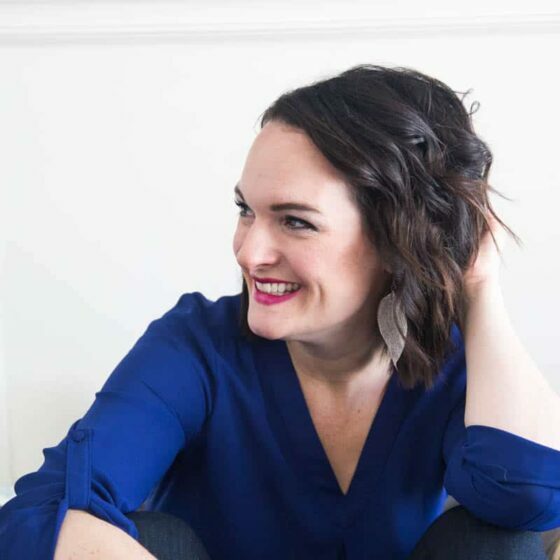 Here’s a baby shower app! There is a hand guard. 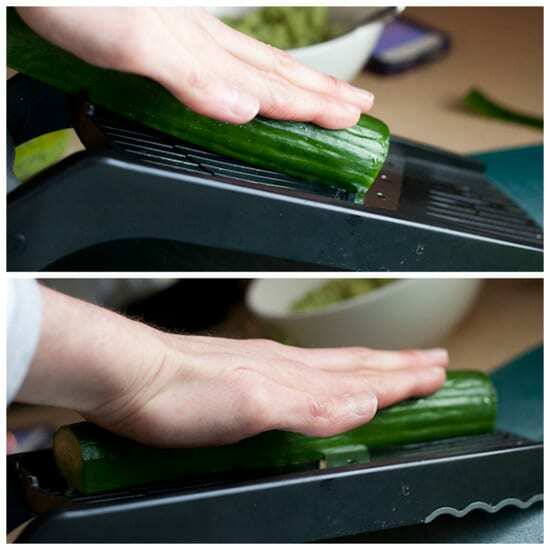 But it’s hard to use a hand guard when you’re slicing a long cucumber. (Otherwise you should use it.) I see chefs slice things all the time this way on Chopped, but their hands are moving at the speed of light. Just keep your fingers curved up slightly, and slice at a responsible speed. 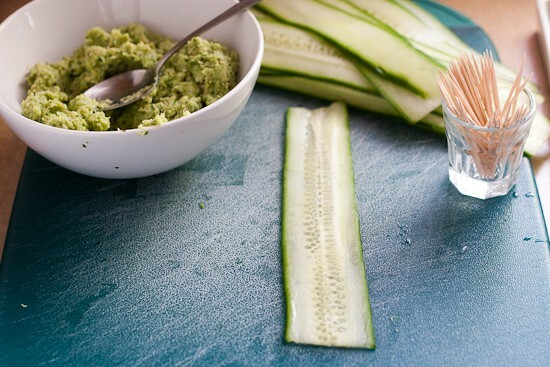 The trick to getting uniform cuts with cucumbers (or any long vegetable) is to maintain pressure where the blade is. If you push hard on one end the entire time, the opposite end is going to suffer. Make sense? I originally made the filling with cream cheese because, like Paula Deen once said, “You can’t have a party without cream cheese.” I have to agree. Because I have that “p” word in my header now and cream cheese isn’t super good for you, I reworked them and substituted avocado for the cream cheese. I actually like them better this way! These come together quicker than you’d expect. 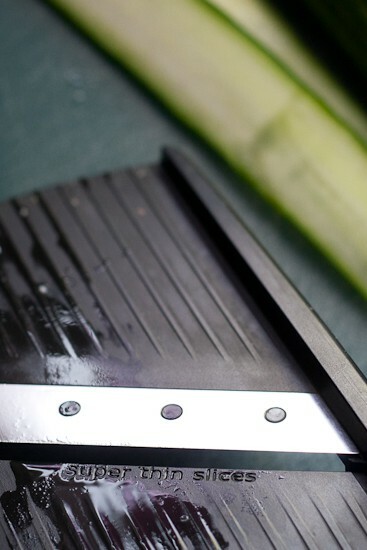 It really, really helps to have a mandoline slicer, though. 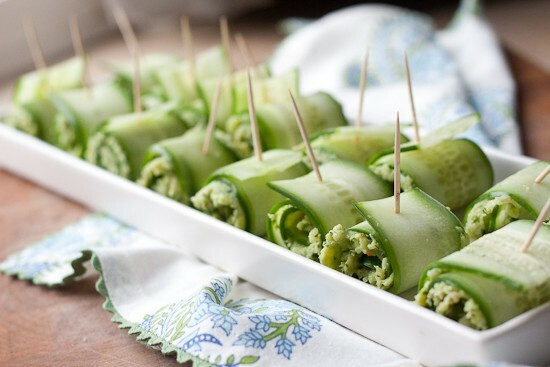 The cucumber slices would be really clunky to roll (and may even break) if they’re too thick. You know what? Take these to game day. I’m willing to be there’s someone there who’s just interested in the food. *I would like to announce that as of this month I am urgent care-free for 3 years! That last trip was a doozy. If your shrimp haven't been cleaned, pull the tails off and run the tip of your knife into the curve of the shrimp to pull out that weird dark stringy thing. That's the digestive tract. You don't want to eat that. 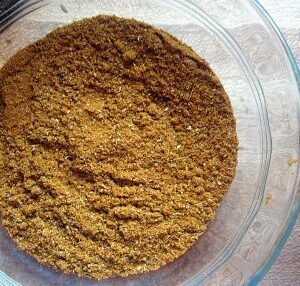 Toss in a couple generous pinches of salt and mix them around. Heat the butter/oil over medium heat in a medium skillet. Add garlic and cook for about 1 minute. Add shrimp to skillet and cook until shrimp has just barely turned pink all over. It only takes a few minutes. Remove from heat and let them cool for a few minutes. Place the shrimp in the food processor with the avocado half, pesto, and lemon juice. Pulse until everything is chopped finely and combined thoroughly. Taste, and adjust salt as necessary. You may want this slightly salty to compensate for the cucumber coming later. 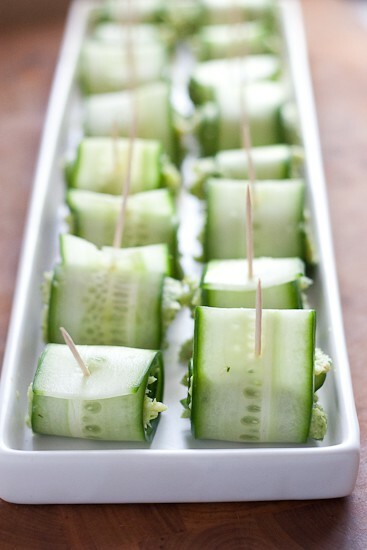 Cut the ends off the cucumber, then slice them as thin as you can with a mandoline slicer. 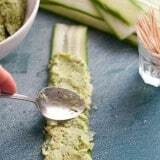 Spread about 2 teaspoons of the shrimp filling onto 3/4 of each cucumber slice. 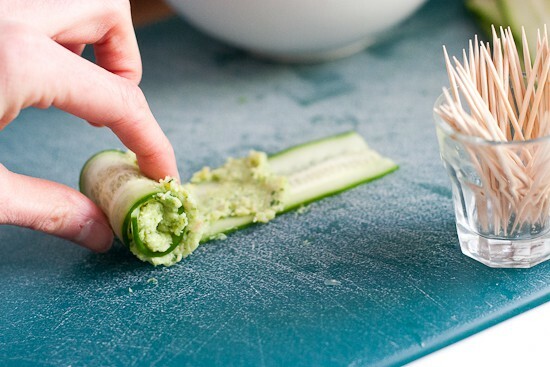 Starting at the filling end, roll it up and secure with a toothpick. 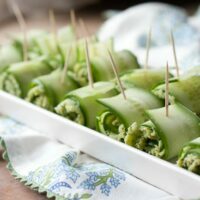 You should have 16-18 cucumber rolls. Store-bought basil pesto contains cheese. You can make your own basil pesto and simply leave out the cheese if it bothers you. 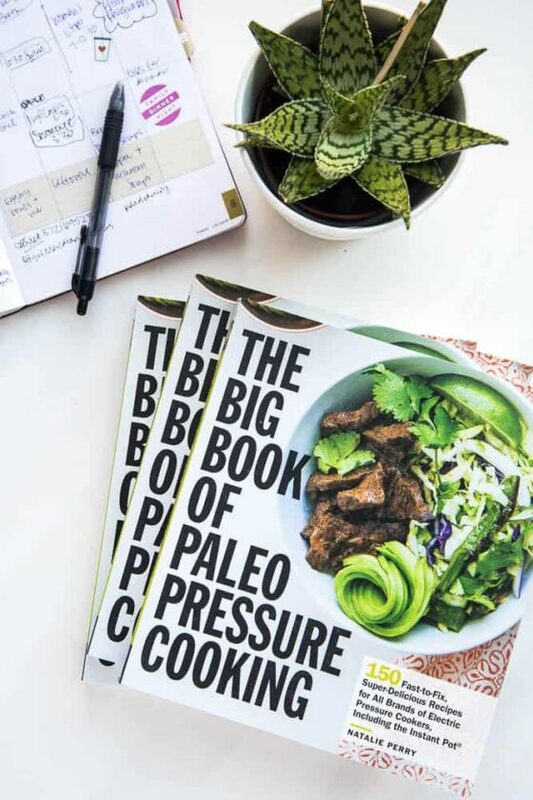 Just combine 2 cups of basil leaves, 1/3 cup pinenuts, 2 cloves garlic, 1-2 Tablespoons fresh lemon juice, and salt to taste in a food processor. Pulse to chop finely. While the machine is running, pour in 3/4 cup of extra-virgin olive oil. Process until smooth. 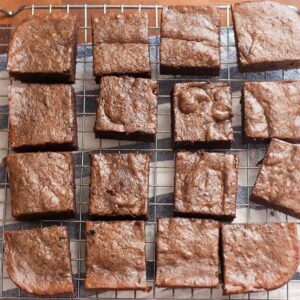 Don't make these more than 2-3 hours before you eat them. They'll start to get watery. These look great Natalie. :) Much healthier than the cream cheese or feta version! Yikes, kind of scary getting the cucumbers that thin, but I think I will risk it. What a wonderful unique appetizer. 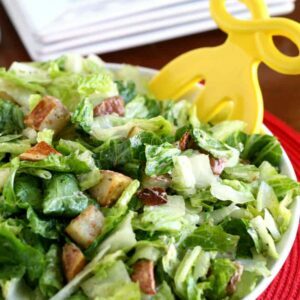 It’s so easy with a mandoline slicer!